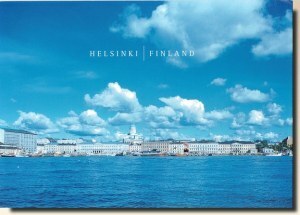 Helsinki is the capital and largest city in Finland. It is in the southern part of Finland, in the region of Uusimaa/Nyland, on the shore of the Gulf of Finland, by the Baltic Sea. Helsinki was established as a trading town by King Gustav I of Sweden in 1550 as the town of Helsingfors, which he intended to be a rival to the Hanseatic city of Reval (today: Tallinn). Little came of the plans as Helsinki remained a small coastal town for a long time, plagued by poverty, wars, and diseases. The plague of 1710 killed the greater part of the inhabitants of Helsinki. The construction of the naval fortress Sveaborg (In Finnish Viapori, today also Suomenlinna) in the 18th century helped improve Helsinki's status, but it was not until Russia defeated Sweden in the Finnish War and annexed Finland as the autonomous Grand Duchy of Finland in 1809 that the town began to develop into a major city.